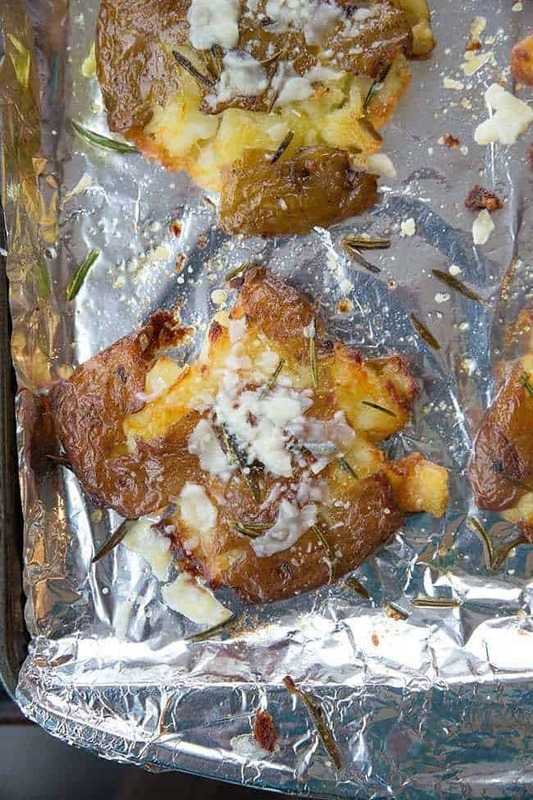 Rosemary garlic smashed potatoes are basically my two favourite things in a side dish; rosemary ( my favourite herb) and potatoes (my favourite starch). Oh and we can’t forget garlic, as this Ukrainian gal loves to put garlic on everything she possibly can. Who here has tried smashed/crash potatoes? You must have as they’ve been around for a good five years now. Smashed potatoes are my favourite way to eat potatoes, those edges get so crispy while the interior stays soft and pillowy. Add in some spices and salt…hoooo boy. Hello heaven! It feels like winter, so I am thinking “winter comfort food” when it comes down to my side dishes. Actually, forget the side dishes, I could eat two of these and a salad and happily call it a meal! Smashed potatoes are also amazing during the summer when it is BBQ season, so really, this recipe is a year round keeper. water. Pre-heat your oven to 400 F.
top of the sheet, around 2-3 inches apart. thick, trying to leave the skin on the top. Sprinkle the garlic, rosemary and salt over top of each potato. Drizzle each potato with olive oil. another 5 minutes or until it melts/browns. Remove and serve! As you can see from my photos, I like mine reallllly crispy on the edges. I probably cook mine longer than most recipes out there and I do try to make them as flat as possible. The key to a really good smashed potato is, of course, the type of potato that you are using. While a lot of recipes for smashed potatoes call for red potatoes, I find that the ones that hold together the best and cook up properly are yellow ones, like Yukon Gold Potatoes. See how flat those smashed potatoes get and how there is skin over the top that crisps up? The other OTHER best part about making smashed potatoes is that you can boil the potatoes ahead of time and refrigerate them until you need to cook them. This is perfect for any parties that you hold, simply bring them to room temperature and them proceed to smash and cook! The other secret to your smashed potatoes looking like the ones I made is that you smash them slowly, very slowly. That’s how you get the skin on top, instead of a burst potato that looks like an alien tore out of it’s chest. Not that it really matters, but if you take a gander at my photos and see how they are so deliciously crispy when you take time to try and get that skin on top…well, I don’t know about you but my mouth is watering. PIN this pic to your SIDE DISHES BOARD and remember to FOLLOW ME ON PINTEREST! 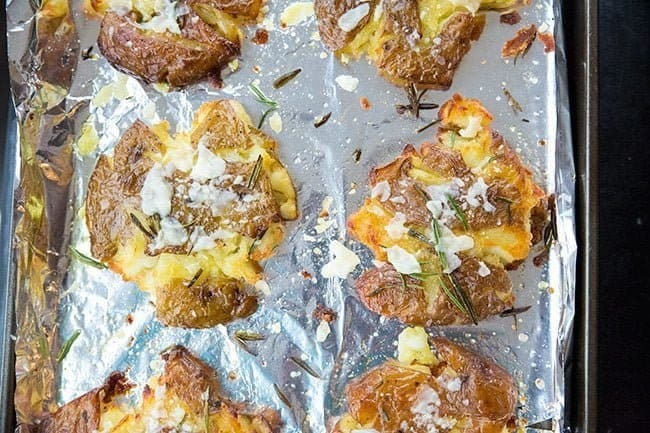 Crispy garlic and rosemary smashed potatoes recipe, with a touch of Parmesan cheese baked on top. The perfect smashed potatoes! Place potatoes in a large pot of water. Bring to a boil and cook until soft. Drain the water. 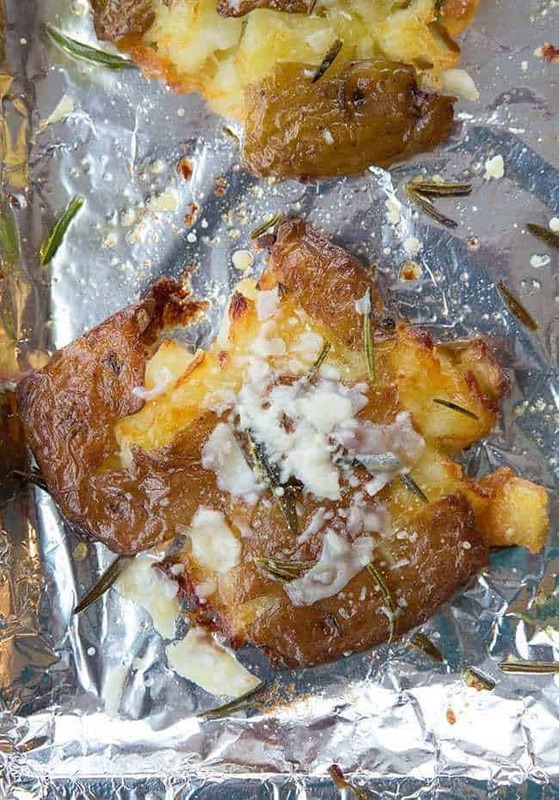 Drizzle olive oil over a large baking sheet lined with tin foil, then place potatoes on top of the sheet, around 2-3 inches apart. Take a potato masher and very slowly flatten each potato until it's about 1 inch thick, trying to leave the skin on the top. The thinner you get them, the crispier they are! Bake in the oven until they reach desired crispiness, ( I usually take around 20 minutes but I like them super crispy!) then add on the Parmesan cheese. Bake another 5 minutes or until it melts/browns. You can adjust the seasonings as desired on top, more or less salt, pepper and rosemary.